Share the post "Abnormal Menstrual Bleeding"
Wondering if whether you are experiencing is abnormal bleeding due to fibroids? 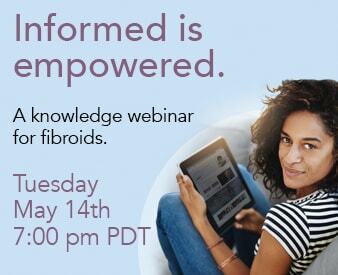 Click inside to read more about what defines abnormal bleeding and how fibroids may be the culprit! I think I may have abnormal menstrual bleeding but what does it consist of and can fibroids be causing this problem for me? You may be experiencing abnormal uterine bleeding if you change pads or tampons more often than every one or two hours, or having a period that lasts over seven days. Abnormal uterine bleeding, or heavy menstruation, which is called menorrhagia in medical terms, is usually the result of a hormonal imbalance in adolescents during the years following the onset of menstruation, or in women who are approaching menopause. Another common cause of abnormal uterine bleeding is fibroid tumors. How fibroids cause abnormal bleeding is not known. Fibroids are believed to alter muscular contraction of the uterus, which may prevent the uterus from controlling the degree of bleeding during a patient’s period. This may result in heavy bleeding during a menstrual period. It may also contribute to abnormal bleeding. Heavy menstrual bleeding is usually caused by fibroids deep within the wall of the uterus (intramural) or those just under the inner lining of the uterus (submucosal). Very small fibroids in the wall of the uterus or fibroids in the outer part of the uterus (subserosal) usually do not cause abnormal bleeding. There are many other potential causes of heavy menstrual bleeding, for this reason careful gynecologic history and physical examination is an important part of the evaluation of a patient with heavy bleeding. Learn more about Uterine Fibroid Embolization online, or contact us directly by calling 866-362-64633 or by requesting a free phone consultation.